Material: PU leather rubber sole. Note: About size: Our size is converted to USA standard according to Amazon size chart. You can choose according to the following suggestions. If your kids have wide and thick feet, we suggest you choose one size larger for him/her. Size suggestions: Size measurement as following. Please measure your heel to toe length and choose size according to the following size measurement. 6.75" foot; size: 11M US Little Kid / 7.5" foot; size: 13M US Little Kid / 8" foot; size: 1.5M US Little Kid / 8.5" foot; size: 3M US Big Kid / 9.25" foot; size: 5.5M US Big Kid / 9.75" foot; size: 7M US Big Kid. When you want to glide, press the button at heel, the roller will pop up automatically. Roller use mute bearing, make gliding more quiet and smoothly. If you just use this for normal sports shoes, you can hide roller by pressing button at heel. Hide the roller by pressing the button, at the same time push the roller back and release the button to lock, and then slide the black window back. In sum, you can pop up and hide roller by a button at heel. High-quality material, breathable, wear-resistant rubber soles, colorful LED light(In case of LED shoes), which is the best gift for lovers and kids for birthday, performances, Halloween, Thanksgiving and Christmas Day and other celebration. Notice: Shoes can be cleaned by soft fabric, but cannot be washed or step into water and dirt. Purchase bigger size is better than small size if you are not sure. (In case of LED shoes) Battery Instruction: The battery can not be replaced, battery can use about 3 month. SIZE SUGGESTIONS: Please measure heel to toe length and choose size according to followings. 6.5"(inch) foot; size: 10M Little Kid/ 6.75"(inch) foot; size: 11M Little Kid(Second from the bottom in size select box) / 7.5" foot; size: 13M Little Kid(The bottom in size select box) / 8" foot; size: 1.5M Little Kid / 8.5" foot; size: 3M Little Kid / 9.25" foot; size: 5.5M Big Kid / 9.75" foot; size: 7M Big Kid. 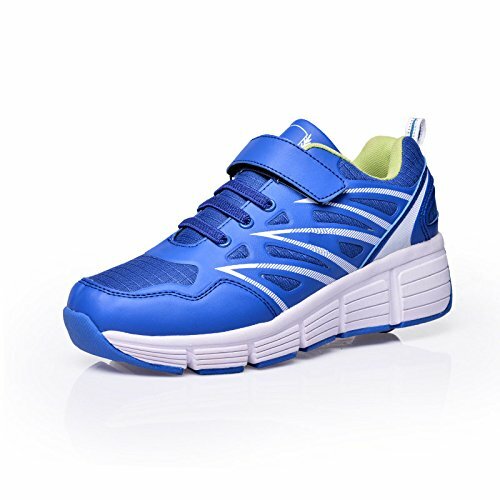 High Quality material, breathable, wear-resistant rubber soles, colorful LED light(In case of LED shoes), which is the best gift for lovers and kids. Our models are divided into those with and without LED light, and those models with LED light include LED in the model name - such as 'LED Black Pink', 'LED Blue', 'LED Pink' and 'LED Red Black'. If you have any questions about this product by SDSPEED, contact us by completing and submitting the form below. If you are looking for a specif part number, please include it with your message.